Look at the walking potential in these wonderful hills and mountains!!!! Álora is surrounded by stunning hills and mountains and is the perfect base for walking (it's why we came to Álora in the first place!). There are literally dozens of mountains in the area that would qualify as Monroes (higher than 3000 feet) in Scotland, and there are gorges, lakes, pine forests, olive groves, classic karstic limestone features, castles and other monuments and much more - and easily accessible. In the immediate area there are the mountains of the natural parks of El Chorro and El Torcal, the Sierra de Aquas and the Montes de Malaga. Within easy reach in this beautiful mountainous region are many other walks, particularly in the Sierra Tejeda around Competa and the Parque Natural Sierra de las Nieves, inland from Marbella. Whether you want an evening stroll, a few hours in the wonderful countryside or a day of hard walking we've got many straightforward itineraries for you to follow, including maps, detailed instructions and directions to get you to the start. Some we've compiled ourselves, others by scouring map and bookshops. Some of the walks you can do from the house or without a car (using public transport or a cheap taxi ride), others cover the wider area but all are within easy reach. 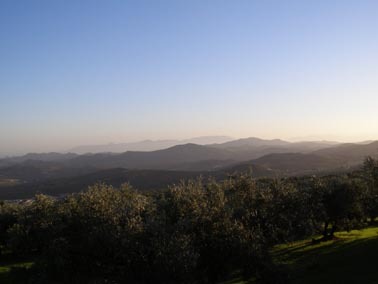 We have tried to select outstanding walks of varying length and character plus, as personally I usually have a desire to get to the top of something, several of the more demanding Andalusian mountains - though I stress that these are all walks, definitely no climbing or anything you have to hang from! There's a summary of some of our favourite ones below (though we are always adding new ones!) - All the routes are kept at the house. El Chorro National Park and the Lakes District. There are several walks of varying standard through this fascinating landscape of lakes and limestone cliffs. 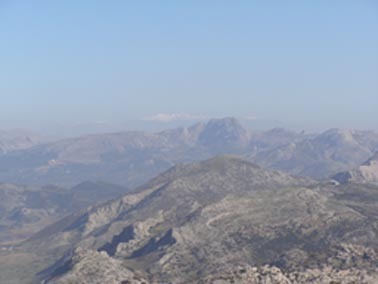 The most arduous is the 1186 metre summit of La Capilla (see below) but we have also mapped out a more moderate walk of 11km (rising to 450 metres) and at the other extreme a 2km stroll to the "Camino del Rey" - the King's path to view a sadly now closed boardwalk, precariously built into the gorge 100m above the water for King Alfonso XIII when he opened the dam in 1921. There is also another short walk to the ruined monastery at Bombastro. Most start from La Garganta, an old flour mill converted into a hotel/bar/restaurant and a very pleasant place to finish a walk!- Pictures from these walks. El Hacho, the mountain overlooking Álora. From the house to the summit of El Hacho (559 metres) is less than 2 km as the crow flies. As you know, crows can fly up vertical cliff faces but the rest of us have to find an easier way, so it's a 10km round trip. A straightforward walk 'round' the mountain with views of the Guadelhorce valley in all directions and a birdseye view of Álora from the top - Pictures from this walk. El Santo, Hacho de Pizarra. A short car or train journey (10 trains a day, 2 euros return) to Pizarra, the next town. El Santo (The Saint) stands on a sheer cliff overlooking the town. This pleasant walk of about 8km starts from the station and climbs steadily through pine forest before emerging on the cliff behind El Santo at one of the best viewpoints in the valley - Pictures from this walk. 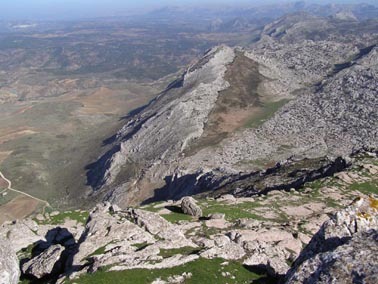 El Torcal National Park. More limestone but very different to El Chorro, a moonscape of amazing weathered rock sculptures. Again a variety of walks of all standards from the ascent of Camero Alto, 1378 metres (see below) to 1.5 km and 3 km strolls around the unforgettable "moonscape" - Pictures from these walks. Laguna de la Fuente De Piedra. The pink or flamingo lagoon at Fuente De Piedra is the only inland flamingo breeding ground in Europe. At approximately 15 square kilometres it is one of the largest natural lagoons in Spain and a rare natural breeding ground for this most elegant of birds. It's quite a long walk but a straightforward circuit of the lagoon on good tracks and the overriding reason for doing it? How often do you get the chance to walk round a lake full of flamingos? El Camarro Alto (1378 metres) - My favorite mountain in Spain to date. Quite unassuming from the road but slowly revealing its delights, particularly the rare opportunity to look on the unique formations of the El Torcal Natural Park from above. A stiff ascent but with a gentle walk in and out through olive and almond groves - and well worth it when you get to the top - Pictures from this walk. 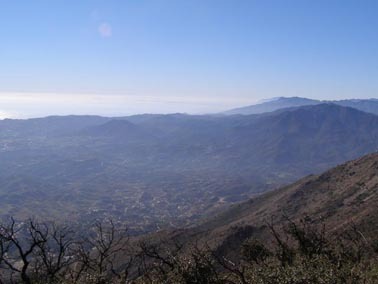 Pico de Mijas (1151 metres) - A coastal mountain affording glorious views stretching to the snow capped (in winter) Sierra Nevada in the east to Gibraltar in the west. A straightforward climb to a decent altitude requiring a tad of fitness rather than mountain skills, followed by a long “social” stroll down with good views over the El Chorro and El Torcal Natural parks - Pictures from this walk. Sierra Aqua (949 metres) - A straightforward walk up a 3,000 foot mountain with outstanding views. In many ways this doesn’t feel like you’re going up a mountain at all. You start walking up a dirt road and after 2 hours or so you get to the top, so a bit tame if you’re expecting to gain your 3,000 feet in the same heroic style as in The Lakes or Snowdonia. On the other hand, you have easy access to a 3,000 mountain on good tracks with easy navigation. 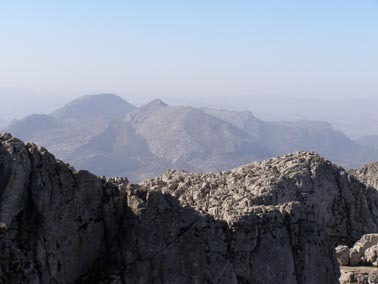 Impressive views slowly unveil, to the coast in the south, then to El Chorro, El Torcal and the Sierra Nevada in the west and finally across the Bobastro resevoir to the plains beyond Antequera in the north. Finally you reach the summit and have the pleasure of all the aforementioned together. Not bad for a tame mountain. There’s just one other thing I should mention, there are 16 wind turbines on the top (yes, it’s that one – you can see them from everywhere!). If you think of these as the scourge of walking humanity then this is definitely not the walk for you - Pictures from this walk. 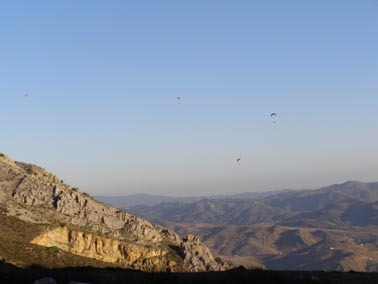 La Capilla (1186 metres) - A wonderful opportunity to get high above El Chorro on easy paths to enjoy not just the stunning views but aerial displays from vultures, eagles and paragliders (not usually all at the same time). A choice of easy, moderate and difficult destinations - Pictures from this walk.